Traders Inn Restaurant at Holiday Inn Leeds-Wakefield01924 230600work RestaurantOffers a delicious menu from light bites to full evening dinner, all freshly cooked. 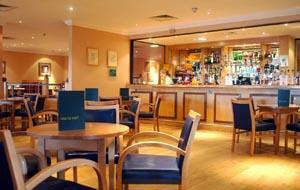 There’s a great range of hotel facilities for business and leisure guests. And Kids Stay and Eat Free*, making it outstanding value for families. Offers a delicious menu from light bites to full evening dinner, all freshly cooked. There’s a great range of hotel facilities for business and leisure guests. And Kids Stay and Eat Free*, making it outstanding value for families. Follow A638 Dewsbury Road. At traffic lights just before the M1 roundabout turn left onto Queens Drive. Hotel sign and entrance is about 20 yards on right.